What is Different about Political Messaging in the Digital Age? Everything. 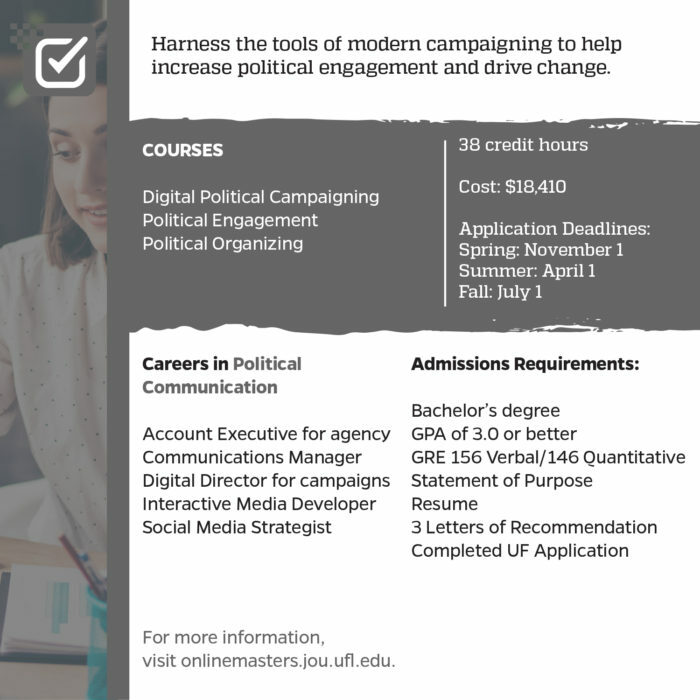 Become an exceptional digital political professional with an understanding of cutting-edge digital advertising, engagement, and analysis techniques in one of four areas of communication that are in particularly high demand. Digital in politics has gone from a $2 million to $1 billion industry in only eight years. Professionals are still trying to keep up with this growth and many aren’t trained in the field. A master’s degree in political communication will give you the unique opportunity to learn from the best in the field and become a true professional. Whether you want to be a communications director on a presidential campaign, a media consultant creating grassroots outreach, or a public affairs strategist, this program is for you. Taught by leaders in their fields, this program prepares you to navigate the thrilling and changing landscape of politics and communication, giving you the tools to make a difference today. Our students harness the tools of modern campaigning to help increase political engagement and drive change. Three benefits of the program are: the flexibility it offers, the highly qualified staff and the short semesters. As a working professional, it makes it much easier to manage a graduate program when I can stay late at work some nights/go to conferences without fear of missing a class. The staff have real-world experience and bring that to their teaching, which shows how applicable these skills are outside of the program.